Celebrate the anniversary of the Girl Scouts with these bite-sized, lemon-wedge cookies dusted in powdered sugar and bursting with lemon flavor. 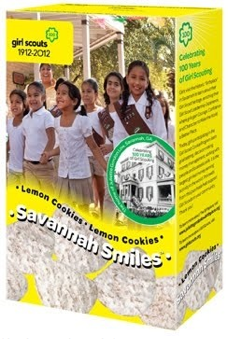 Enjoy these delightful treats, remember where Girl Scouts began ...and smile. The cookie's name was inspired by the hometown of Girl Scouts founder Juliette Gordon Low. Each year, thousands of Girl Scouts visit the founder's historical home, a National Historic Landmark in Savannah. In the time-worn rooms, each girl considers how, 100 years later, Juliette Low's story encourages her to dream big and do great things with her life. That's why we are so proud to offer this special cookie that will delight customers and remind girls of their rich heritage and unlimited future. We're not sure we think of dreaming big and doing great things as we bite into lemony cookies, but sure, whatever floats your boat. Girl Scout cookie season varies by region, find out how to buy cookies in your region here.